Violin Memory have cool technology, but do they have a future? I hope so! Since visiting Violin Memory at Storage Field Day 8, it has taken me a while to get around to writing this post, and I guess the reason is because I am both frustrated, and a little bit sad. They were the first guys who (for me at least) truly tamed the beast that is flash storage, packed it up into a blisteringly fast product with insanely low latencies, and released it into the big wide world. An organisation I worked at took that product and threw thousands of desktop users at it, a number of very busy SQL TempDBs, and some other frankly evil workloads. It didn’t even blink an eye! With Violin Storage on the back, I have seen RDS desktop customers stress test the platform with up to 100 users in a single VM! The thing that makes me sad is that to date, Violin have not yet turned a profit. This is not some upstart company out of the boondocks! This is a mature company, founded in 2005, who provide their product to some of the biggest enterprises in the world. Yet so far they have not managed to make a penny! Anyway, there are other guys in the industry who are far better at financial analysis than me (for example Justin Warren did a post on this very subject just last week). So I will leave it to them try to work out why this is the case, because I like to talk tech! Looking at the latest incarnation, once again Violin have “evolutionized” [sic] something which is technically very impressive. The original Violin OS has been given the boot and has been replaced by something they call Concerto OS, which blends elements of the original software with some updated features. In development is also support for a multi-controller configuration beyond the current dual, though this is obviously not GA yet. 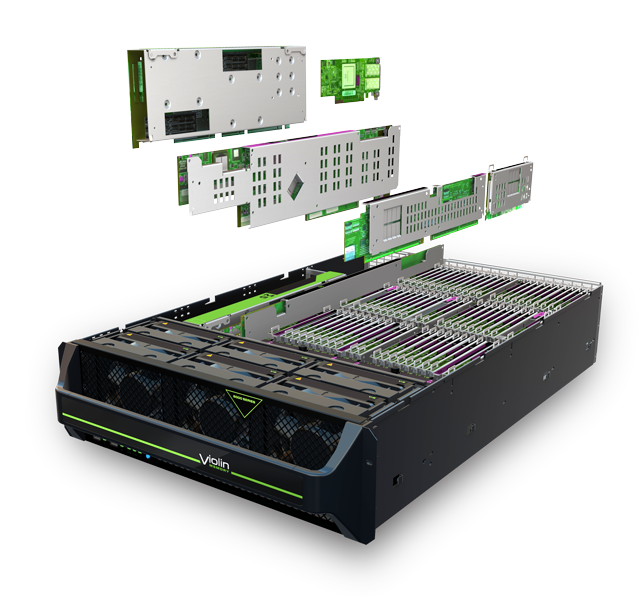 The new dual controller Flash Storage Platform supports FC, iSCSI and Infiniband, as well as RDMA and ROCE. It is all packaged in a 3U appliance with up to 64 redundant flash modules. 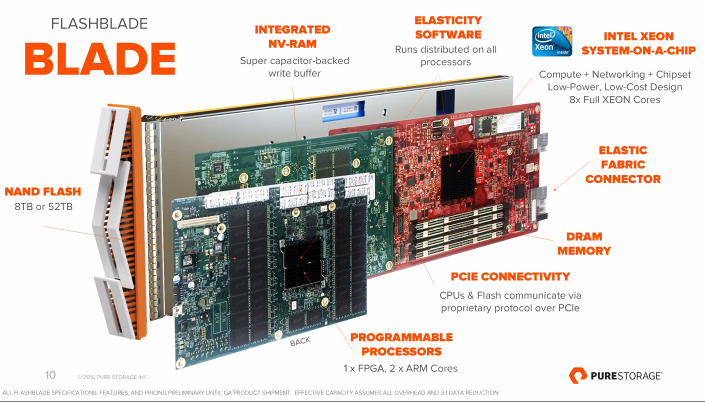 Thanks to their own custom backplane design, it is capable of 10-12GB/sec of throughput! At 100% sustained writes they have measured 400,000 IOPSat RAID5, which is more than many of their competitors can achieve with 100% reads!It should be noted that this was on the performance model, which does not support dedupe. 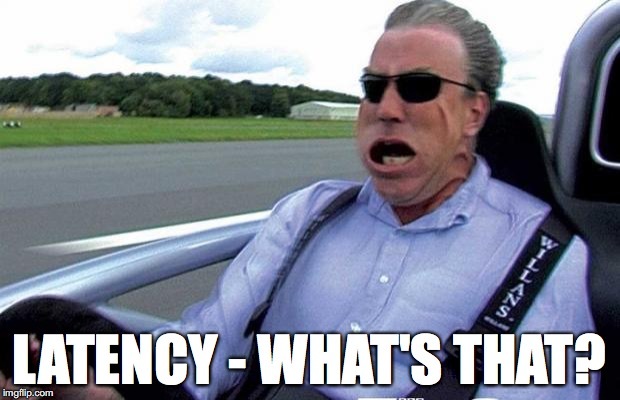 All in all the new solution just screams FAST! In fact, I’m surprised they didn’t paint a red stripe down the side of the chassis! So why on earth are Violin not ruling the AFA world right now? As a frickin cool technology with hyper speed storage, they deserve to be up there at the very least! If I had to hazard a guess, it’s because for most companies, good is good enough. 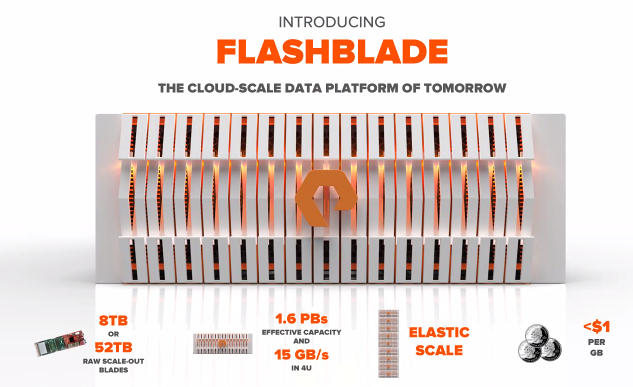 With the smorgasbord of All Flash Arrays available today, if you don’t need latency measured in microseconds and massive IOPS/bandwidth, then you have a huge array of choices (pardon the pun). At that point features, price and support become more important than straight line drag racer performance. If Violin can stop burning cash and break even, then perhaps they have a future. I for one, hope so! They will also be presenting again at SFD9 this week, and I’m looking forward to finding out what they plan to do next! 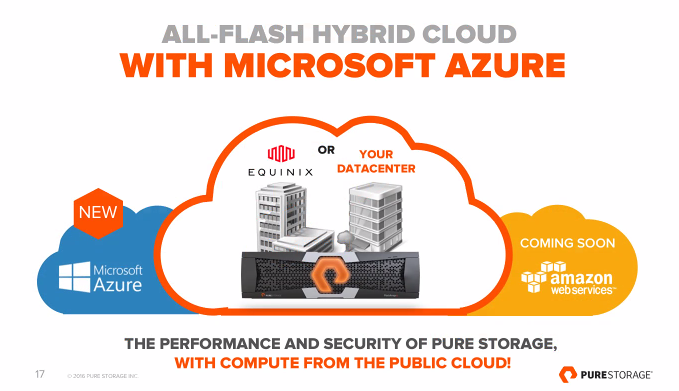 Pure Storage are probably one of the best known “All Flash” vendors in the industry today, but one of the things which has set the bar a little high for smaller organisations to get a slice of this speedy action, is the price. Well, the good news is that for customers with smaller projects or simply smaller budgets, a Pure AFA is now within reach! 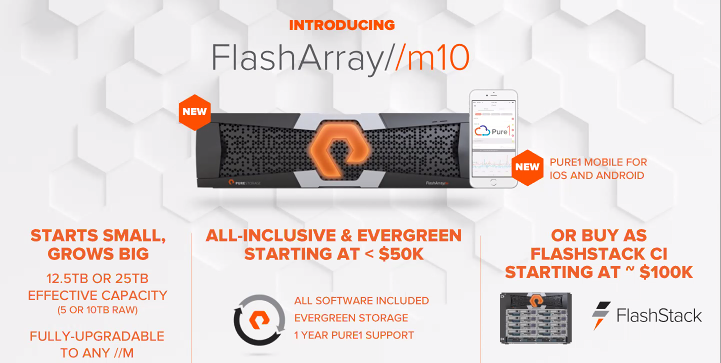 At Pure Accelerate today, along with their new FlashStack and FlashBlades, Pure announced a mini version of their ever popular M-series arrays, the FlashArray //M10. This new array is fully featured, comes in the same form factor and with all of the same software, support, etc as the bigger models (//M20, //50, //70) but at a lower entry point of <$50k list including the first year of support. Not only that, but it is in-place non-disruptively upgradeable to the larger controller models later, all the way up to the //M70, so it is possible to buy in at this cheapest level and upgrade as business needs dictate later. The only main differences between te //M10 and other Pure models is the lack of expansion ports on the controllers (you need at least an //M20 if you want to add shelves), and reduced compute / DRAM capacity. Specs are pretty much in line with the rest of the arrays in the range, with the //M10 coming in at 5TB / 10TB raw. Depending on your workloads, after dedupe and compression, this could be up to the stated useable (12.5TB/25TB). Mileage, as always, may vary! This is the perfect quantity for many use cases, including small to medium sized VDI environments, critical databases, etc. I suspect the //M10 may even find its way into some larger enterprises who’s internal processes often dictate that every project has its own budgets and its own pool of dedicated resources! Lastly, and possibly most importantly to small businesses who may not have full time staff dedicated to managing storage, Pure’s monitoring and upgrade services are all included as well, via Pure1. I think this is a positive step for the company and will help to engage with their customer base earlier in the organisational lifecycle, and when combined with their unique and very sticky Evergreen Storage offering, it will enable them to keep customers for life!